Can Cabinet Office's WordPress-based commentable bills make a difference? The Protection of Freedoms Bill, published last week, has become the first piece of proposed legislation to go through a ‘public reading stage‘, as promised in the Coalition Agreement. The No10 website says it’s ‘the first step towards meeting the Coalition’s commitment to introduce a public reading stage for all Bills, allowing the Government to test the technology and ensure the system works well.’ And the technology in question is WordPress. It’s a fairly straightforward presentation, using a custom WordPress theme bearing the catchy name ‘Cabinet Office Commentable Document (non-core)’, produced by the Cabinet Office’s in-house digital team – in double-quick time, so I’m hearing. The government branding is very understated indeed, with only an HM Government logo, in the bottom right corner. It looks like it’s all based on pages, as opposed to posts, with a jQuery-based expand/collapse menu (which I suspect has been hard-coded) in the left margin. It’s sitting on the same Amazon account as the main Cabinet Office site. Can it work as an idea? I’m not convinced. The commenting technology’s certainly up to it, as we’ve proven time and again. But legislation isn’t exactly written to be read; you don’t have to dig too deeply into the site to find unintelligible passages, with every other sentence cross-referencing another subsection of another chapter of another Act… and no hyperlinking (even though all the source material should presumably be available in legislation.gov.uk). I just can’t imagine how an ordinary member of the public could be expected to make sense of it. … instantly allowing you to see where text has been added and/or changed, and how. Wikipedia offers something similar: if you click on ‘View history’ for any page, you’re able to compare various past versions of the page, and see the changes highlighted (albeit in a less-than-friendly fashion). 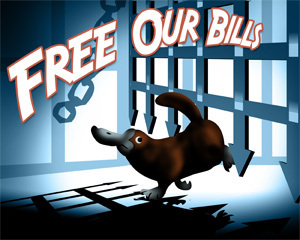 And indeed, back in 2007 MySociety proposed a diff tool (of sorts) as part of their Free Our Bills campaign. Without this, I can’t imagine many ordinary people going to the trouble of decoding what’s actually being proposed… meaning I can’t see it doing anything to widen participation, if that’s the intention. So whilst it’ll be useful as a pilot exercise, I fear it’ll only prove the difference between green/white papers, which are text documents intended to be read; and bills, which just aren’t. Posted on February 15, 2011 Categories e-government, politicsTags cabinetoffice, freeourbills, wordpress7 Comments on Can Cabinet Office's WordPress-based commentable bills make a difference? But there’s a lot more good stuff in it than just that (!). I note in particular the recommendation to take the Lords Of The Blog website further – incidentally, its recent facelift is a dramatic improvement (and I’ll be mentioning it in my WordCamp talk at the weekend); and the explicit commitment to allow people to embed video clips on their own websites, in a direct challenge to the existing (YouTube-centric) ban. (In fact, in their list of ‘action already taken’, they say ‘We have approved members uploading their contributions to the House’s proceedings onto YouTube.’ – so maybe the ban’s gone already, at least on the Lords’ side? Never let it be said that politicians as a whole don’t get it.